Epson Demonstrates Scenic Projection Experiences at USITT 2019 | Industry Analysts, Inc.
Who: Epson will shocase its advanced laser projector solutions along with its ELPLX02 ultra short-throw lens at the USITT19 Conference & Stage Expo. From powerful projection to advanced solutions for multi-channel audio and video applications, Epson, Dataton and Show Sage will demonstrate the latest scenic projection and stage production tools for theater and live entertainment professionals at USITT booth (#1343) in Louisville, Ky. from March 21-23.
Who: Epson will showcase its advanced laser projector solutions along with its ELPLX02 ultra short-throw lens at the USITT19 Conference & Stage Expo. From powerful projection to advanced solutions for multi-channel audio and video applications, Epson, Dataton and Show Sage will demonstrate the latest scenic projection and stage production tools for theater and live entertainment professionals at USITT booth (#1343) in Louisville, Ky. from March 21-23. Pro L1755UNL – Ideal for rental and staging, as well as permanent large venue installations, the Pro L1755UNL laser projector enables creative professionals to present extraordinary content for the world to see. 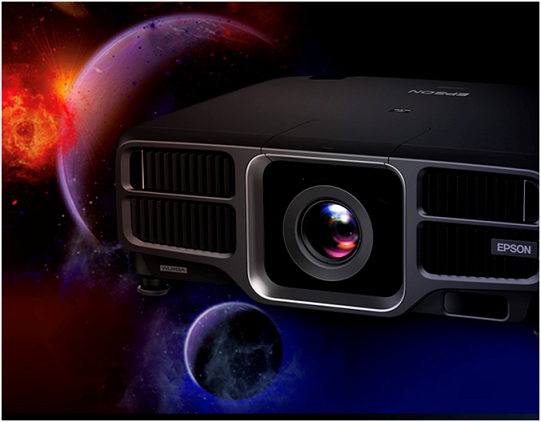 The premium projector offers native WUXGA performance with 4K Enhancement Technology1 to deliver brilliant image quality for even the most demanding environments. The projector offers up to 15,000 lumens of equal color and white brightness2 from a standard 120 V power source for true-to-life color reproduction with incredibly precise detail. Featuring a laser light source, as well as 360-degree rotation in any direction for off-axis positioning, and a full range of input compatibility for a variety of venues and application support, the projector offers uncompromising performance. Pro L1505UHNL – This large-venue projector combines a laser light source and 3LCD technology for powerful, uncompromising images. Engineered for events staging, the Pro L1505UHNL features native WUXGA performance with 4K Enhancement Technology1, and up to 12,000 lumens of equal white and color brightness2 to deliver sharp, image quality, even in well-lit environments. Offering diverse connectivity options, remote management and control tools, and 360-degree installation flexibility, this projector is ideal for rental and staging environments and areas where longevity and image quality combined make a difference. ELPLX02 Lens – Available alongside Epson’s extensive selection of lenses, the ELPLX02 ultra short-throw lens projects up to 1000- inches from just a few feet away, enabling Epson’s Pro L-Series laser projectors to deliver large images from very short distances. With a 0.35 throw ratio, negative offset and impressive lens shift range, the ELPLX02 lens is the perfect solution for space-constrained environments and rear-projection applications with incredible installation facilitating and positioning flexibility. When: Thursday, March 21 – 11 a.m. to 5:30 p.m.
Friday, March 22 – 11 a.m. to 5:30 p.m.
Saturday, March 23 – 9:30 a.m. to 2 p.m.
Kentucky International Convention Center, Louisville, Ky.
2 Color brightness (color light output) and white brightness (white light output) will vary depending on usage conditions. Color light output measured in accordance with IDMS 15.4; white light output measured in accordance with ISO 21118. EPSON is a registered trademark, EPSON Exceed Your Vision is a registered logomark and Better Products for a Better Future is a trademark of Seiko Epson Corporation. All other product and brand names are trademarks and/or registered trademarks of their respective companies. Epson disclaims any and all rights in these marks. Copyright 2019 Epson America, Inc. This entry was posted in Epson and tagged Epson, projection, USITT 2019 by IA Staff. Bookmark the permalink. Next → Next post: Want to Keep Digital Equipment Functioning Properly While Reducing Service, Parts & Equipment Replacement Costs? It’s Simple. Get ESP!